A conviction for being a member of an unlawful assembly requires proof that there was an unlawful assembly consisting of at least five persons. If that ingredient is proved, It is not necessary to prove the identity of five or more persons constituting the unlawful assembly. A finding that there were a number of persons who took part in the riot is not enough. A mere assembly or gathering of persons is not unlawful though some of its members may employ force to commit an offence. In all cases of unlawful assembly, not only must the charge set out the common object but evidence must establish beyond reasonable doubt that the common object was entertained by the assembly and was shared by all of them before any one of them could be found guilty of being a member of such unlawful assembly. Where common object is not proved, there can be no conviction under this section. Where the common object stated in a charge of rioting was not objected to, in the lower court and no finding was given on that point, it must be held that the common object was that stated in the charge and a conviction based on it, was right and that the accused was not prejudiced. If common object is proved, the mere fact that specific offences with which members of an unlawful assembly are charged, are not proved does not mean that the unlawful assembly should be found to be non-existence. To constitute an unlawful assembly there must be some present and immediate purpose of carrying into effect the common object. A meeting of deliberation only and to arrange plans for future action to be taken individually and not jointly does not constitute an unlawful assembly. But once the common object is established the mere fact assembly. But once the common object is established the mere fact that no actual offence was committed would not prove that there was no common object. A change over in the common object can only be established by evidence of the conduct of the assembly by words spoken, by the acts done and generally by the other details connected with movement in the activity of the assembly. 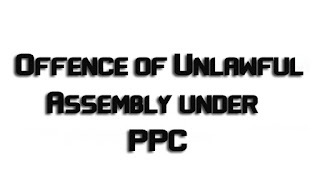 The section would apply only where the common object of an assembly is unlawful. 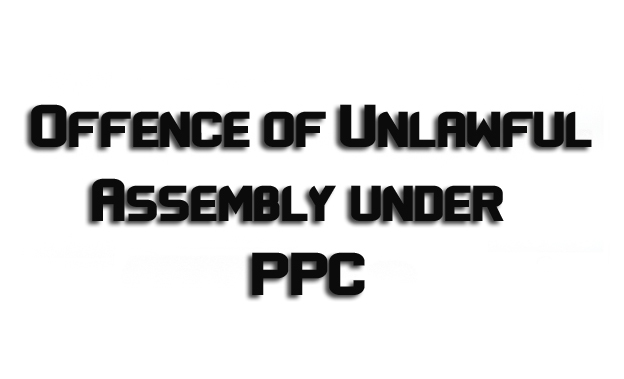 Where the assembly is performing a lawful act, it cannot be declared an unlawful assembly. Even where persons collect and demonstrate together knowing that they are exercising their lawful right of assembly, it is their attackers who are an unlawful assembly. The formation of an unlawful assembly is not to be assumed merely because five or more persons meet at a particular place and shortly afterwards some offence or offence is committed. There mere presence in a crowd cannot render anybody liable, unless there was a common object and he was actuated by the common object and that object was one of those set out in S.141. Some unmistakable overt act contributing to the prosecution of the common object should always be proved before a person is convicted for membership of an unlawful assembly or for rioting. Mere presence will not unusually be that unmistakable act; but presence plus the carrying of weapons will bring him mare to the common object, unless he explains why he carries the weapon concerned. If, in addition to presence and weapons, there are cries clearly indicating a determination to attack members of another group, the position is cries, if he marches along with the others into the opposing group and uses this weapon, and then it is complete evidence of membership of the assembly. After an assembly is declared unlawful and asked to disperse, failure to do so is sufficient indication of a behavior from which it members of the unlawful assembly.